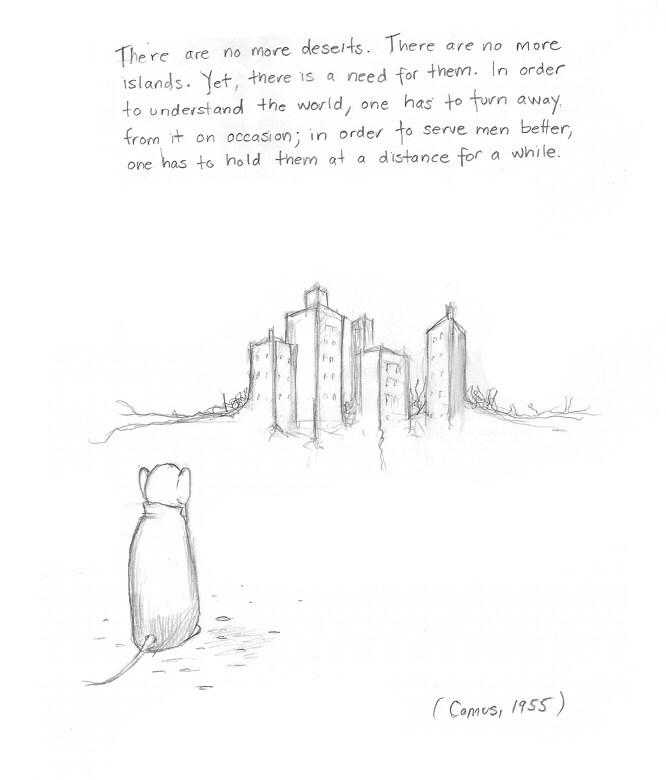 This entry was posted in Philosophy and tagged camus drawing, camus myth of sisyphus, camus quote illustration, there are no more deserts, there are no more islands by simonandfinn. Bookmark the permalink. You have to get away and have a total view from the outside. Belonging to a community, but not to be confused in it. Exactly! I feel that this is one reason why parks are so important. I think it was Jeremy Rifkin that said urban areas are like having an solipsistic relationship with the human brain. That’s the 2nd time in the last few days I see the word solipsistic – never new this word before – and having looked it up twice now, I am still not sure I could actually use it in a sentence! The 1st instance for me was in the book “1984”, which I just finished reading – THAT was a challenging one, too! Great perspective to be gained, for sure! Hi Maggie! It’s a great word. And 1984 is a great book. I can’t recall where in the book he used solipsistic, but given its theme it seems like the right word. Did you enjoy the book?